In Greek mythology, Helios was a handsome god with the shining aureole of the sun about him. Every day he drove a team of horses who pulled a chariot containing the sun across the sky. 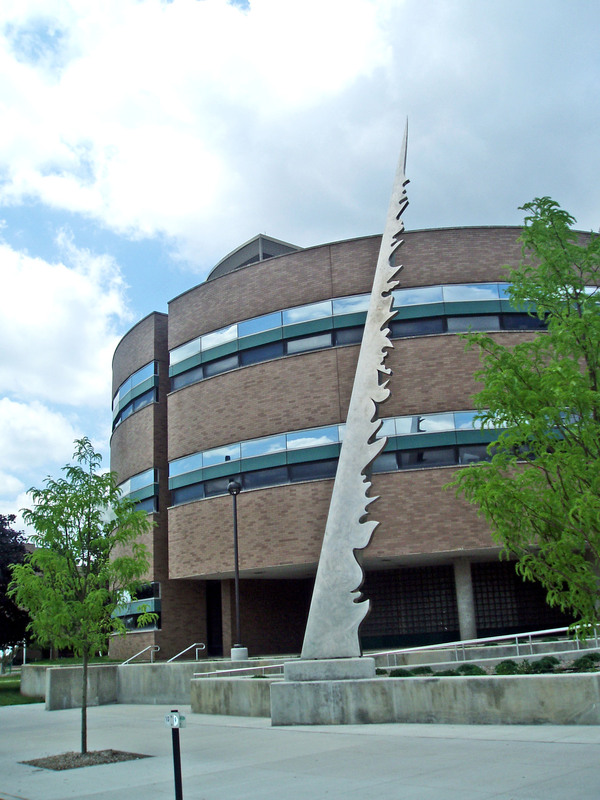 Administrators at the Wayne State College of Engineering had funds, in the 1980s, to commission a sculpture that would convey the common interests of artists and engineers. They held a competition to design such a piece for their campus. A professor of sculpture at Northern Illinois University, Bruce White, won that competition. He took as his theme the sun God, Helios. He wished to convey the idea that the sun blazes light and thereby illuminates the earth. There are two tapered shafts of stainless steel in the work of art. Each of them may suggest rays from the sun. This sculpture has retained its very bright surface so it is best appreciated with the real sun shines upon it. Because of its location on West Warren not so very far from the intersection with Woodward, it is one of the most viewed if not always appreciated sculptures in the city. I believe there may be some at the Wayne State College of Engineering who would like to see this sculpture as the icon symbol of their institution. Born in 1933, the sculptor studied at the University of Maryland and earned a doctorate from Columbia University. He taught at several colleges in the United States. Most of his pieces are large, abstract metal sculpture done in steel or aluminum. So far as I know, this is the only sculpture of Bruce White on public display in Michigan. If you visit Helios Trail, you might also pause at the nearby sculpture, Untitled, by Edward Sykes. This impressive piece commemorates Wayne State University Professor Andrzej W. Olbrot who was killed by his students while administering a final examination in 1998.